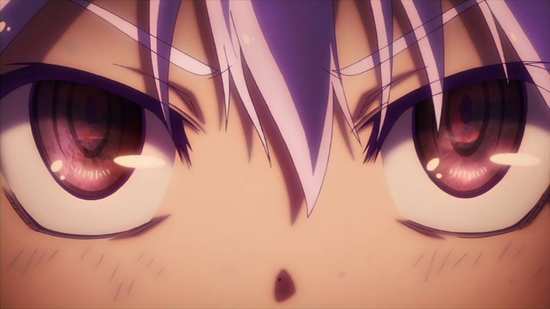 No Game, No Life’s feature film spin off has its work cut out for it. It has to defy my expectations for a second time. Let’s face it; I wasn’t inclined to watch another ‘lost in a parallel world’ story when the original series came out. Even then, the concept had been done to death in similar shows. But when I saw this particular show, about a pair of gaming NEETs lifted out of their humdrum lives and transplanted to the world of Disboard, where the ‘One True God’ placed them to make use of their gaming talents, I had to reconsider my objections. Disboard is a world of many races, one where the powerless humans, Imanity are on the lowest rung of the ladder. But this is a world where war has been abandoned for games, where power and territory are gambled over a handful of playing pieces and a player’s skill. And then with the two protagonists, Imanity finally had the chance to climb that ladder. 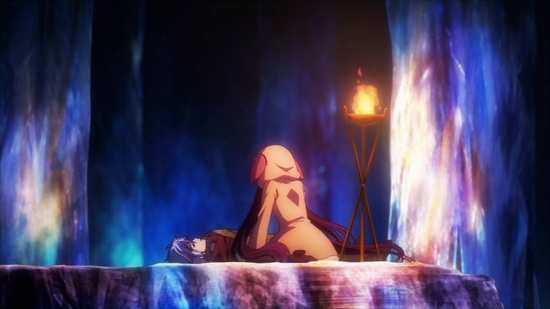 After I got past the retina burning visuals, I have to admit that No Game, No Life won me over. But then the movie disc shows up for review, and I learn that none of the characters from the series are in the film, that it’s actually set 6000 years prior, with none of the trappings of the TV series. It’s going to have to win me over, all over again. I tell a lie, one or two of the series characters do make a cameo, but its story is a completely different animal. A friendly game is a good place to tell a story, and the one true god Teto decides to tell the story of Disboard, six thousand years previously. Back then, the world was a blasted ruin, battleground for all the races competing for their particular deity to be chosen supreme, and then there were the vermin, the powerless humans who had no piece in this game, just happened to be unfortunate enough to live in the most bloody battlefield in existence, or rather under it, as the survivors had long since retreated underground. Riku is one such human. As a child he refused to believe in losing, loved games, and thought he could change the world that way. That childish fantasy was shattered when his village was destroyed, leaving him the sole survivor. Now he lives by scavenging, seeking out enough intel to keep one step ahead of the multi-race war and keep his community of humans alive for one more day. But then in the ruins of an elf city, he encounters an Ex Machina, a member of the machine race, but one that doesn’t want to kill him. Instead, Schwi’s on a mission to understand the human heart, to understand just why this downtrodden species tenaciously clings to life against all the odds. 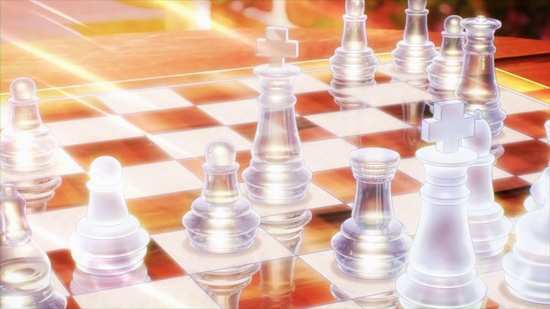 Riku’s reluctant to say the least, but when Schwi challenges him to a game of chess, she changes his mind, and that has the potential to change the world. Apart from the bookend scenes set in modern day, neon hell Disboard, the majority of the film is set during that colossal war, so there is a whole lot of red, blasted earth and savage skies, while the underground world of the humans is by its very nature dark and subdued. 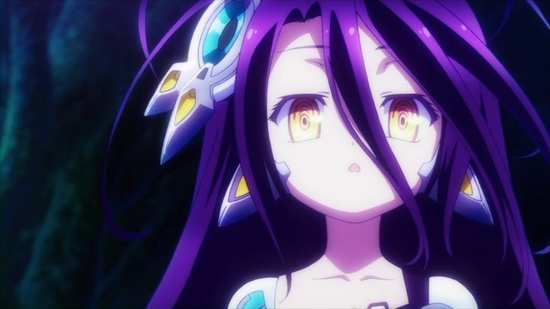 Having said all of that, No Game, No Life Zero does still stick to its TV series roots, and even the darker shades are brighter in a way that seems against the laws of physics. Studio Madhouse give the animation a solid theatrical presentation, wonderful character designs, effective world design and smooth and energetic animation. The disc gets a 1.78:1 anamorphic NTSC transfer, progressively encoded, and it has strong detail, consistent colour reproduction, and an absence of significant compression, other than the usual digital banding. It’s a solid DVD presentation, which will naturally be bettered by the Blu-ray. You have the choice between DD 5.1 Surround English, Spanish, and Japanese, with subtitles and signs in English and Spanish, locked during playback. It’s an excellent, immersive surround track showcasing a film which is strong with detailed sound design. The action is explosive quite naturally, but the environments come across well as does the film’s music. I stuck with the Japanese audio throughout, and the subtitles were accurately timed and free of typos. The disc presents the film with a static menu, and pesky UPOPS lock the player timer away. I had to use VLC to figure out the timings. You get 1:47 of Japanese promos for the film. There is also a Behind the Scenes featurette that lasts 19:35, which sees the English dub cast and crew interviewed about the film, and to a lesser degree the original series. I’ve facetiously said before that No Game, No Life’s psychedelic colour palette gave me vision problems. When it comes to No Game, No Life Zero I was having problems of a different kind with my vision... tears getting in the way. No Game, No Life was nifty. It was cool to see these two, gaming addicted social recluses winding up in a world where their talents could make a difference. 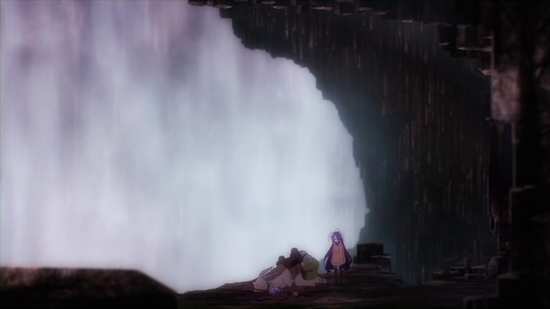 It also was enchanting to see a world where differences and enmities were worked out via wagers and games instead of battles and bloodshed, which allowed humanity, or rather Imanity to work their way up from the lowest of the low thanks to Sora and Shiro. But No Game, No Life was nifty, it was smart, and with the usual anime vernacular it was funny as well. 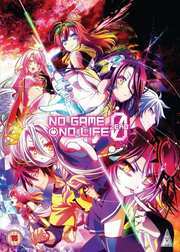 No Game, No Life Zero tells the story of how the world of the series came about, and it has the one thing that was lacking. It has heart, and it has it in abundance. We’re introduced to a world torn apart by war, on the verge of destruction, as the various gods fight a proxy war with the races on Disboard to see who will be supreme. It’s the humans, who alone among the races lack for a deity, who wind up getting caught in the middle and dying. It’s a world where the people live in hiding, underground, and where the few must be sacrificed for the sake of the survival of the many. That’s a choice the protagonist Riku has had to make on several occasions, as he goes on recon missions for the sake of his community. As it is, he’s constantly struck with survivor’s guilt, finding it hard to keep going, and he’s lost all semblance of hope. 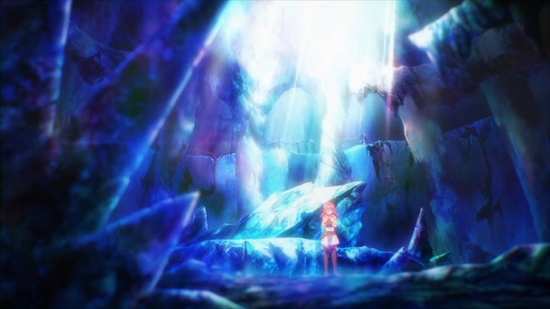 That hope begins to glimmer again when he encounters the Ex Machina Schwi, who challenges him to a game, wanting to learn the secret of the human heart. 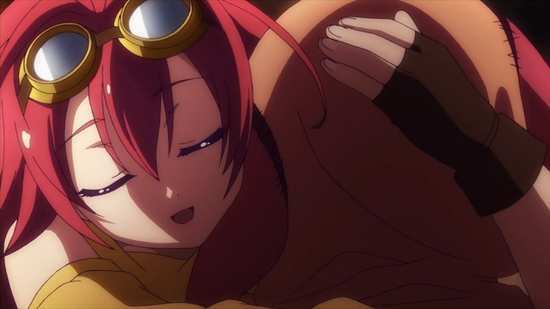 Schwi is effectively an android, but one that has been exiled, cut off from her collective. She’s also nursing a different sort of guilt, which gives her something in common with Riku. She initially starts helping Riku come out of his depression, both with her innocence and her desire to play games, which jogs one of the few positive memories that Riku has. 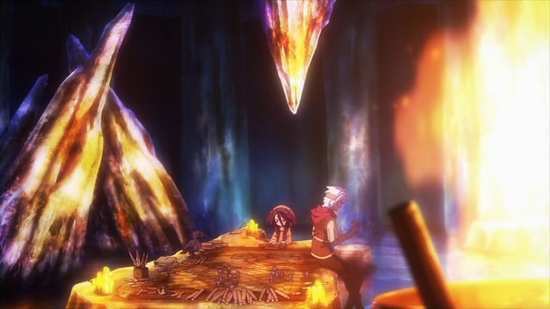 With Schwi’s android abilities, Riku’s able to reconnoitre areas that he couldn’t before, and he learns some imminent truths about the world which certainly raises concern, but being reminded of games, he has an idea that might allow humanity to turn the table on all of the ‘higher’ races. On a narrative level, it’s certainly appealing to see this blasted wreck of a world change course and head to the future that will eventually become the world of the series, but the reality of the situation, the devastating war and the effect that it has on the people, particularly Riku grabs you on the emotional level. Clawing hope from utter despair always makes for good storytelling, a last-ditch attempt to save the day no matter the cost keeps the viewer on the edge of the seat. 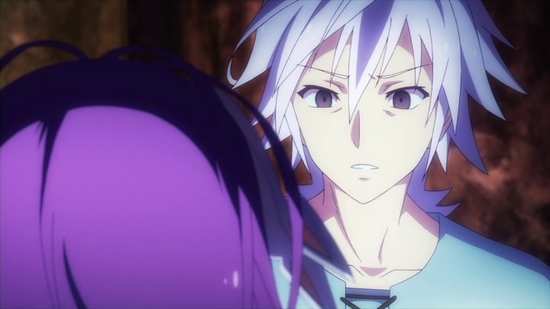 And on top it all, we have the relationship between Riku and Schwi, the love story developing through the film’s runtime, so that by the time the film ends, I’d defy anyone not to wipe a tear or two from the eye. 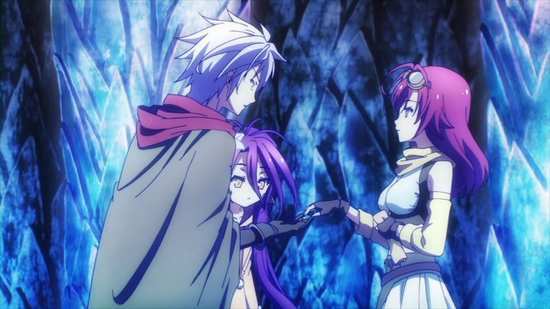 No Game, No Life Zero is probably the best anime film that I have seen this year, it works on every level. The one slight hitch is that you really should watch the series first as that helps in making clear the stakes the characters are fighting for, lets you appreciate the parallels between this war torn world and ‘gamers’ paradise’ it would eventually become. You don’t need it for the continuity, but it still helps. Now excuse me while I place an order for the Blu-ray.